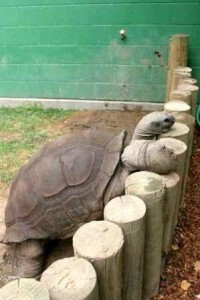 Interested in a Aldabra Tortoise behind the scenes tour? Native to Aldabra Islands and Seychelle Islands in the Indian Ocean. Introduced on Mauritius and Reunion Islands. Aldabra is an arid coral atoll 18 miles long; a mosquito infested mangrove lagoon connects with the ocean on 4 places, actually making it 4 islands. Most of the tortoises are found on the largest of these, the South Island. Terrestrial. Scrubland. Total wild population restricted to the Aldabra Atoll (a small group of coral islands in the Indian Ocean). There are many different habitats on the islands where tortoises are found such as scrub, mangrove swamp, and coastal dune. The largest concentrations of tortoises are found on the grasslands called platins. 32 to about 50 inches. Largest specimens weigh 500 pounds or more. Believed to reach beyond 100 years of age and may be the longest lived of all animals. This is hard to prove because they have outlived the scientists that were studying them, and proper records were not kept. 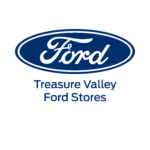 Primarily vegetation of dry grasses and fallen leaves. Occasionally eat small invertebrates and carrion. High, domed carapace, long neck, long legs with strong claws. Sexual maturity determined by size rather than by age; most begin to reproduce when they reach approximately half their eventual size. Females lay between 9 and 25 eggs in a hole dug in sand; less than half are fertile. In a healthy, uncrowded population a second clutch laid within the same breeding season is likely. There is no parental care after the eggs are deposited. Feet are modified for efficient walking on land. Legs are longer than many Chelonia, and their bodies are carried off the ground. Will feed early in the morning then seek shade when midday tropical temperatures become too hot. Will often wallow, coating the fleshy parts of their body with mud to protect themselves from mosquitoes. 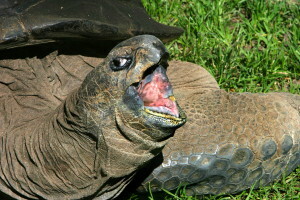 The Aldabra tortoise is the largest animal on the atoll. It fills a similar role to the one occupied by elephants in Africa and Asia. As with elephants, they are the main consumers of vegetation and will noticeably alter the habitat during their search for food. Tortoises have been known to knock over small trees and shrubs to obtain nutritious leaves. This makes pathways and clearings within the forest lands for other animals. Seeds pass through the tortoise’s digestive tract and eventually become food for many other species. The Aldabra tortoise was one of the first species to be protected to ensure its survival. Charles Darwin and other notable conservationists of the late 1800’s along with the governor of Mauritius set aside a captive breeding population on Mauritius as well as protecting the Aldabra Atoll. Aldabra tortoises are the remnants of a larger population of tortoises in the Indian Ocean. There were 18 different species which, because of hunting by sailors and the predation upon eggs and hatchlings by introduced species such as rats, cats, and pigs, were all made extinct with the exception of the Aldabra.